The warmer weather is excellent for working in the garden. Damper days also enable the plants to grow really well, this unfortunately helps the weeds to take a really good hold so when there’s a dry spell use a hoe to remove as many weed seedlings as possible in the borders. The changing weather is a great help but can also be a nuisance to ponds and water features. On the positive side any new pond plants introduced now will do really well – warmish water and plenty of sunlight plus of course a good stable medium to secure their roots into will ensure healthy plants but of course algae and blanket weed thrive in such good conditions too. There are several general rules to follow with any pond: Make sure that any pond has a part with a minimum water depth of 45cm (18”) so that a range of plants can be grown, fish have a deeper section of water to hide in and also the pond doesn’t freeze solid during winter. The more water there is then generally the longer it will take to warm up during the summer. Shade about half of the pond with floating plants this will reduce algae growth and also give the pond better visual effect. Never put too many fish into a pond or have too many plants as this will create quite a lot of debris that will decompose and release methane into the water – too many fish also depletes the water of oxygen although if you wish to increase oxygen levels in a pond then install a simple fountain. Lastly ensure that you have enough oxygenating plants in the water. There are lots of really good pond plants available now. Everybody must want a water lily in their pond. They can be quite a handful when they start to spread so choose the variety carefully. They usually come with instructions attached to the container so read these carefully before purchase and then you’ll know if you are buying the correct plant, I’d recommend buying plants from a reputable retailer or garden centre who can give good plant advice. Don’t be tempted by the flowers (no impulse buying here!) as really the spread and growing conditions are more important. Oxygenating plants are very important in any pond. Usually they grow quite rapidly and reduce pollutants in the water as they turn harmful carbon dioxide (produced by fish and creatures in the water) into oxygen – they also compete for nutrients with the algae. Lagarosiphon major is a well known oxygenating plant, although this can grow quite large it can easily be pruned and it thrives in full sun. Floating leaved plants are good at covering a portion of the water surface therefore stopping the growth of algae. Marginal plants are the other main plant source required in a pond. The roots are usually below the water level with their leaves and flowers poking through the water. It is for these types of plants that the perforated plant pots at garden centres are for. 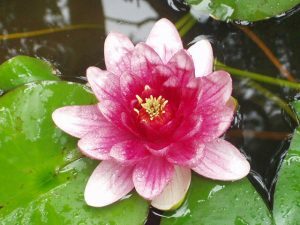 Again it is important to buy the correct type of plants for your pond, as different plants require different depths of water.